Hitchens completed 2018 with 135 tackles (81 solo) over 15 games during 2018. Analysis: Although Hitchens didn't do much else of note for fantasy purposes, he finished fifth in the NFL in tackles thanks to a move from Dallas to Kansas City last offseason, boosting him onto the fantasy radar. 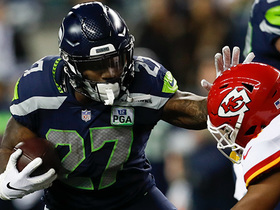 Set for the second year of a five-year deal with the Chiefs in 2019, Hitchens should sit near the top of IDP options again next season and could top his output from 2018 if he can stay on the field for all 16 games. Hitchens racked up 12 tackles (five solo) during Sunday's 38-31 loss to the Seahawks. Analysis: Hitchens logged his second straight game with double-digit tackles, and he performed admirably against Seattle's run-heavy offense. The 26-year-old has been a valuable IDP asset this season, with 126 tackles through 14 games. Hitchens had 11 tackles (five solo) in Thursday's 29-28 loss to the Chargers. Analysis: Hitchens has produced well throughout the season, yet Thursday was the first time he reached double-digit tackles since Week 6 at New England. The 26-year-old has 114 total tackles and a forced fumble through 13 games and has a matchup against the run-heavy Seahawks on tap in Week 16. Hitchens notched 10 tackles (five solo) during a Week 13 matchup with the Raiders. Analysis: Hitchens exited the game for a bit with a quad injury, but that didn't prevent from reaching double digits in tackles for the fifth time this season. Barring an injury, the fifth-year linebacker is a lock to reach triple-digit tackles for the first time in his career, making him a valuable IDP option in many formats. He needs just four Sunday against the Ravens to reach triple digits, a total he has surpassed in all but two of the games he's played in this season. 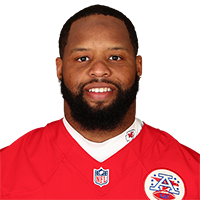 Hitchens (quad) was able to return to the field for the Chiefs on Sunday, BJ Kissel of the Chiefs' official site reports. Analysis: Hitchens was questionable to return after suffering a quad injury in the first half of Sunday's game. Now that he's back, expect Hitchens to assume his normal role as one of the starting linebackers for Kansas City. Hitchens (quad) is questionable to return to Sunday's game against the Raiders. Analysis: Hitchens suffered the quad injury in the second quarter of Sunday's game, and his status is currently up in the air. As long as Hitchens is sidelined, Dorian O'Daniel could see increased snaps in his stead. Hitchens (ribs) was a full participant in Thursday's practice. Analysis: Hitchens sat out a Week 10 win over the Cardinals due to a ribs injury, but he appears to have fully recovered. Barring any setbacks, expect Hitchens to return to his usual starting role during Monday's game against the Rams. Hitchens was active but didn't play in Sunday's game against Arizona, Brooke Pryor of The Kansas City Star reports. Analysis: Chiefs coach Andy Reid said that Hitchens was only active so that he could play in an emergency situation. Hitchens had been questionable with a rib injury entering Sunday's game, and it seems he's not back to 100 percent quite yet. For the time being he's expected to play against the Rams in Week 11, Nate Taylor of The Athletic reports. Look for Dorian O'Daniel or Ben Niemann to see some extra snaps if Hitchens is limited next week. Hitchens (ribs) is active for Sunday's game versus the Cardinals, BJ Kissel of the Chiefs' official site reports. Analysis: Hitchens has posted eight or more tackles in four of the last five games. The fifth-year pro already has 80 stops through nine games, and needs just five more to notch a new career high in the category. Hitchens (ribs) is questionable for Sunday's game against the Cardinals, BJ Kissel of the Chiefs' official site reports. Analysis: Hitchens managed to log limited participation in Friday's practice after having been sidelined to begin the week. The starting linebacker suffered a rib injury during a Week 9 win over the Browns, and he appears truly questionable for Sunday's tilt against the Cardinals. If Hitchens is unable to suit up, expect Dorian O'Daniel to slot into the starting lineup. Hitchens (ribs) did not practice Wednesday. Analysis: Hitchens was able to retake the field after suffering a rib injury during Kansas City's win over the Browns in Week 9 but still appears to hindered by the injury. The starting linebacker should be considered questionable for Sunday's game against the Cardinals, but, given that Hitchens has played through this issue before, it appears that he has a solid chance of suiting up. Hitchens finished Sunday's game against the Browns with eight tackles (all solo). Analysis: Hitchens briefly exited Sunday's contest, but it didn't prevent him from returning and playing 69 percent of the team's defensive snaps. The veteran linebacker owns 79 tackles (50 solo) through nine contests this season and should remain one of the better IDP options on the Chiefs' defense. Hitchens (ribs) returned to Sunday's contest following a brief absence, Brooke Pryor of The Kansas City Star reports. Analysis: Hitchens' injury only kept him out for a few minutes before he was able to make a return. Given the quick return, it's likely the injury is not something that will linger too much or affect Hitchens' availability down the line. Hitchens left Sunday's game against Cleveland with an apparent rib injury. Analysis: It's unclear how severe Hitchens' rib issue is right now. He'll likely go through a series of evaluations with the medical staff before any decision regarding a potential return is reached. Dorian O'Daniel is the likely replacement during Hitchens' absence. Hitchens (ribs) is listed as active for Sunday's game against the Browns, BJ Kissel of Chiefs.com reports. Analysis: Hitchens was able to practice in a limited fashion late in the week after suffering an injury to his ribs during the Chiefs' Week 8 win over the Broncos, setting him up to play Sunday barring any pregame setbacks. Hitchens (ribs) is listed as questionable for Sunday's game against the Browns. Analysis: Hitchens sustained the rib injury in last Sunday's win over the Broncos and was given a week-to-week recovery time frame. The 26-year-old was a limited practice participant Thursday and Friday, and he at least appears to be trending in the proper direction. Hitchens (ribs) was a limited participant in Thursday's practice, BJ Kissel of the Chiefs' official site reports. Analysis: Hitchens was unable to practice to begin the week after suffering bruised ribs during a Week 8 win over the Broncos, so his limited participation is encouraging. It wouldn't be surprising for the Chiefs to take a cautious approach to Hitchens' health if he's unable to fully recover prior to Sunday's game against the Browns. If Hitchens misses any time, expect Dorian O'Daniel to enter the starting lineup. Hitchens severely bruised his ribs in Sunday's win over the Broncos and is considered week-to-week, Ian Rapoport of NFL Network reports. Analysis: Hitchens avoided breaking any ribs but could still miss some time due to the injury. He's currently without a return timetable and should be considered questionable for the time being ahead of Sunday's tilt against the Browns. Hitchens suffered a ribs injury during Sunday's 30-23 win over the Broncos. Analysis: Hitchens was initially listed as questionable to return to the Week 8 contest but was ultimately downgraded to out. A timetable for Hitchens' recovery remains unclear, and Dorian O'Daniel is expected to slot into the starting lineup if Hitchens misses any time. Hitchens made 14 tackles (six solo) in Sunday's 43-40 loss to the Patriots. Analysis: Hitchens played all 78 defensive snaps in the Chiefs' first loss of the season. It's his fourth double-digit tackle performance and he's averaging 10 per game overall, which puts him on pace to shatter his previous career high of 84 stops. Hitchens recorded 10 tackles (seven solo) in Sunday's win over Jacksonville. Analysis: Hitchens now has double-digit tackles in three of the Chiefs' five games this season. He hasn't recorded much in the way of a pass rush or pass coverage, but his consistent tackle totals make him an IDP option. He'll look to help stymie Tom Brady and the New England offense in Week 6. Hitchens posted 12 tackles (seven solo) in Sunday's win over the Steelers. Analysis: Hitchens has racked up double-digit tackles in back-to-back games to start the season. He's had a strong start to his first year in Kansas City, well on pace to setting a career high in tackles. Looking ahead, Hitchens and the Chiefs will look to stay perfect on the season as they face off against the 49ers in Week 3. Hitchens recorded 15 tackles (seven solo), including two for loss, in Sunday's 38-28 win over the Chargers. Analysis: Hitchens was all over the field, with his 15 tackles equaling his career high. He recorded a career-high 84 tackles last season, but he'll shatter that mark in his first year with Kansas City if he can come even close to equaling Sunday's effort on a weekly basis. He'll look to keep his momentum in Week 2 against Pittsburgh. Hitchens (hamstring) rejoined the Chiefs for practice Monday, BJ Kissel of the Chiefs' official site reports. Analysis: Hitchens returned to practice quickly after injuring his hamstring Saturday, indicating that the issue was likely minor. 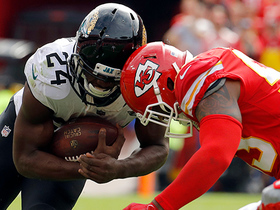 However, the recurring nature of soft-tissue injuries means that the Chiefs could take a cautious approach to reintegrating their newly acquired inside linebacker into training camp. Hitchens was sidelined during Saturday's practice due to a hamstring injury, Nate Taylor of The Athletic Kansas City reports. Analysis: It's unclear when Hitchens sustained the injury, but it most likely occurred at Friday's practice. The severity of hamstring injuries can be tricky to gauge, so expect the Chiefs to err on the side of caution with their newly acquired inside linebacker in order to ensure his health entering the regular season. Both Terrance Smith and Dorian O'Daniel figure to be in line for increased reps at practice while he is sidelined. Hitchens plans to sign with the Chiefs for five years and approximately $45 million, Terez A. Paylor of The Kansas City Star reports. Analysis: A 2014 fourth-round pick, Hitchens had at least 67 tackles each of his four seasons in Dallas, including a career-best 84 in only 12 games last year. The size of the contract suggests he's ticketed for a three-down role, which typically wasn't the case during his time with the Cowboys. The 25-year-old will replace Derrick Johnson in the middle of the Kansas City defense. Hitchens finished the regular season with a career-high 84 tackles (55 solo), two passes defended and a forced fumble in 12 games. Hitchens (knee) won't carry an injury designation into Sunday's game against the Seahawks, Gregg Bell of The Tacoma News Tribune reports. Analysis: Hitchens sustained the injury in Sunday's win over the Raiders but was able to finish the week with a full practice Friday to avoid the questionable tag. The Cowboys middle linebacker should see his usual workload as the team's playoff hopes are on the line Week 16. Cowboys owner Jerry Jones said Monday that he's optimistic that Hitchens, who sustained a knee injury in Sunday's win over the Raiders, will be able to play Week 16 against the Seahawks, Jon Machota of The Dallas Morning News reports. Analysis: Hitchens departed in the final minute of Sunday's game with the injury, finishing the night with six tackles (one solo). Those who had rolled with Hitchens in IDP formats were likely disappointed with the outing, especially after the linebacker racked up a combined 29 stops over the past two games. Assuming the knee issue doesn't prove too problematic as the Week 16 matchup approaches, Hitchens should have a decent chance at reaching double-digit tackles again. Hitchens collected 14 tackles in Sunday's win over the Giants. Analysis: Despite the fact that Sean Lee returned from his hamstring injury and got 18 tackles of his own, Hitchens remained productive, hitting double digits in tackles for the second straight game and third time in five weeks. The Cowboys' middle linebacker could see plenty of action again in Week 15 on the road against Marshawn Lynch and the Raiders offense. Hitchens accrued 15 tackles (12 solo) against the Redskins on Thursday. Analysis: Unsurprisingly, this was a season high for Hitchens. Of course, this kind of performance can't be expected on a consistent basis, especially since in four of Hitchens' eight games this season, he has posted six or less tackles. Hitchens is active for Thursday's game against the Redskins, David Helman of the Cowboys' official site reports. Analysis: Hitchens has been dealing with a groin injury for the past couple of weeks but we will continue to play through the pain Thursday night. If he is at all hindered by the injury, look for Jaylon Smith to possibly see an increase in defensive snaps. Hitchens (groin) is active for Sunday's game against the Chargers, David Helman of the Cowboys' official site reports. Analysis: Hitchens came into Thursday's game with a questionable tag after suffering a groin injury in Sunday night's loss to the Eagles, but the linebacker will not be hindered by the short week and is set be a full go on Thanksgiving. Hitchens (groin) is listed as questionable for Thursday's game versus the Chargers, David Helman of the Cowboys' official site reports. Analysis: Hitchens emerged from Sunday's loss to the Eagles with a slight groin strain, but a subsequent MRI gave the linebacker hope he would be able to avoid an absence in Week 12. 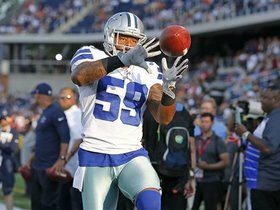 After putting in two limited practices this week, Hitchens believes he'll be able to suit up for the Thanksgiving Day matchup, according to Brandon George of The Dallas Morning News, but the Cowboys will likely wait and see how the linebacker performs during warmups before clearing him to play. Hitchens is hopeful to play Thursday against the Chargers after an MRI on the groin injury he sustained in the Week 11 loss to the Eagles came back negative, Kate Hairopoulos of The Dallas Morning News reports. Hitchens injured his groin during Sunday's game against the Eagles and is questionable to return, Rob Phillips of the Cowboys' official site reports. Analysis: Before exiting, Hitchens was tied for the team lead with five tackles. Jaylon Smith will presumably fill in for the remainder of the game if Hitchens isn't able to return. Hitchens collected a team-high 10 tackles in Sunday's loss to the Falcons. Analysis: With Sean Lee (hamstring) hurt once again, Hitchens stepped up as the most productive Cowboys defender, although he doesn't have the impact on the game that Lee does. With the veteran expected to miss the next two or even three games, Hitchens should be a steady IDP option during that period. 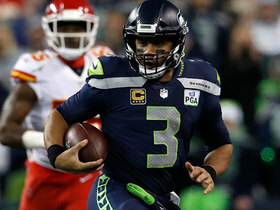 Seattle Seahawks quarterback Russell Wilson takes off for big pickup on third-and-long. 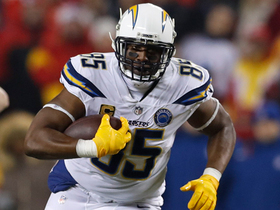 Los Angeles Chargers tight end Antonio Gates shows he's still got it after this 14-yard catch and run against the Kansas City Chiefs. 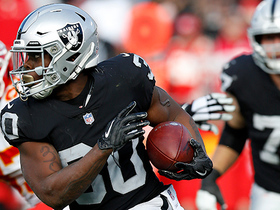 Oakland Raiders running back Jalen Richard navigates through Kansas City Chiefs defenders on a 23-yard run. 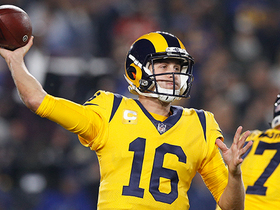 Los Angeles Rams quarterback Jared Goff throws to tight end Tyler Higbee on a 17-yard fourth-down conversion. 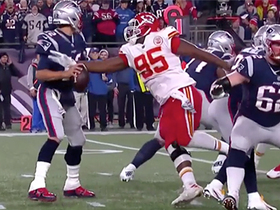 Kansas City Chiefs defensive tackle Chris Jones sneaks up to strip-sack New England Patriots quarterback Tom Brady out of nowhere. 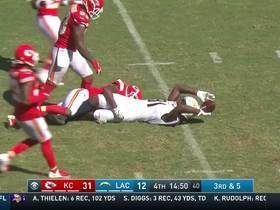 Kansas City Chiefs linebacker Anthony Hitchens reads the run perfectly and throws Jacksonville Jaguars running back T.J. Yeldon down for a loss. 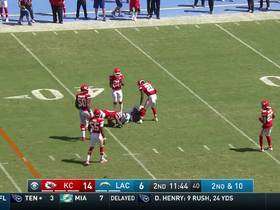 Los Angeles Chargers wide receiver Mike Williams makes his first catch of the season, converting a third down with a 25-yard grab. The "Good Morning Football" crew reacts to the news that the Chiefs will sign former Dallas Cowboys linebacker Anthony Hitchens in the 2018 free agency frenzy.